A couple of weeks ago we featured 10 Musicians and Bands Rocking it with WordPress. But it’s not just the musically talented who use WordPress as their blogging platform of choice – there are plenty of actors and actresses out there who also see it as the perfect platform for promoting their brand online. The following list features everyone from genuine film legends, to infamous funnymen, to up and coming talent. It just goes to show that size and scale is no threat to WordPress – it can handle almost anything you throw at it. So without further ado, let’s explore these 8 actors and actresses who rely on WordPress! Rarely do you find someone as multi-talented as Margaret Cho – an actress, comedienne, author, singer-songwriter and fashion designer. She has featured in an enormous number of movies television shows, including Face/Off, Ghost Whisperer, and 30 Rock. Her site is a brilliantly colorful design, once again showing how WordPress can be utilized to produce something utterly unique. 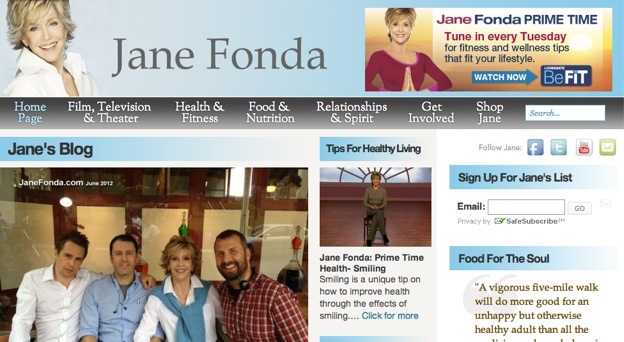 Jane Fonda is a living legend, with a career spanning no less than five decades. These days she has a wide focus, which is clear from her website – from film, to health and fitness, to relationships and spirit. She also has a very active blog, where she posts plenty of photos from her travels. Felicia Day is a Twitter fanatic, with nearly 2 million followers. So it should come as no surprise that she’s also a prolific blogger – there’s plenty for you to keep up to speed with if you are a Day fan. Her site is what you might call in the “traditional” mold of a WordPress blog, but it is also heavily integrated with Twitter (as you would expect), Flickr, and even Delicious. 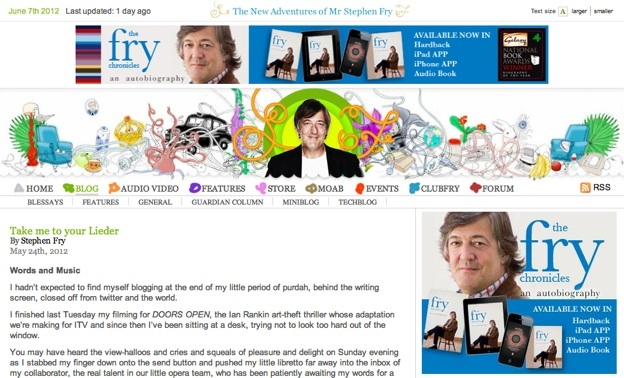 There is not a single English person reading this who will not have heard of Stephen Fry, and many of the rest of you will have too. Whilst he has been acting since the early 1980s (alongside the likes of Hugh Laurie and Rowan Atkinson), in the last few years he has made major inroads into Hollywood with roles in television shows like Kingdom and Bones, and movies like Sherlock Holmes: A Game of Shadows and Alice in Wonderland. 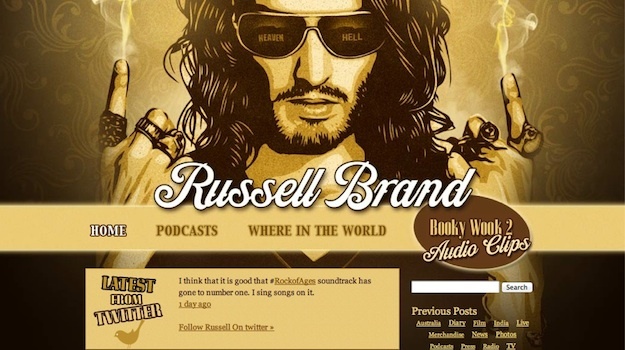 Another UK export, Russell Brand made a seemingly smooth transition into Hollywood with scene-stealing roles in movies such as Forgetting Sarah Marshall, Get Him to the Greek, and Despicable Me. 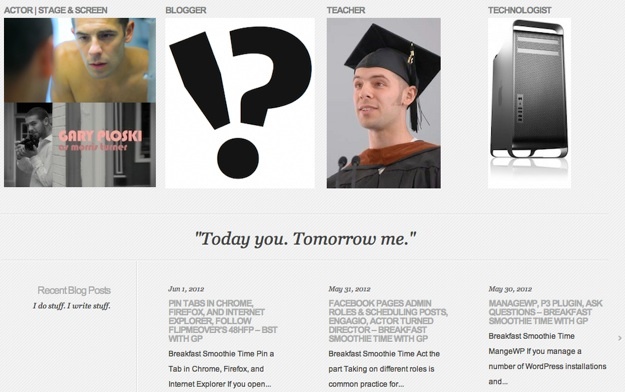 His site is another testament to what is possible with WordPress. Although it is in a fairly standard content left, sidebar right format, its highly graphical design makes it anything but standard. Also known as Silent Bob, Kevin Smith is a cult figure turned accomplished actor and director. Although he is perhaps still best known for his part in Clerks, his resume stretches far beyond that, having directed the likes of Dogma and Red State. Who better to finish the roundup than Sylvester “Sly” Stallone – a true Hollywood legend. Although some might consider him to be a “disposable” action hero type, he has been nominated for two Oscars (both for Rocky, which he both starred in and wrote). 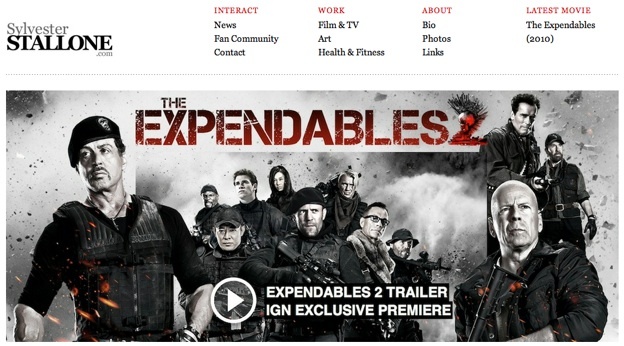 The site is an example of good minimalistic, text-focused design, with very little in the way of imagery with exception to the large promotional graphic at the top of the page.